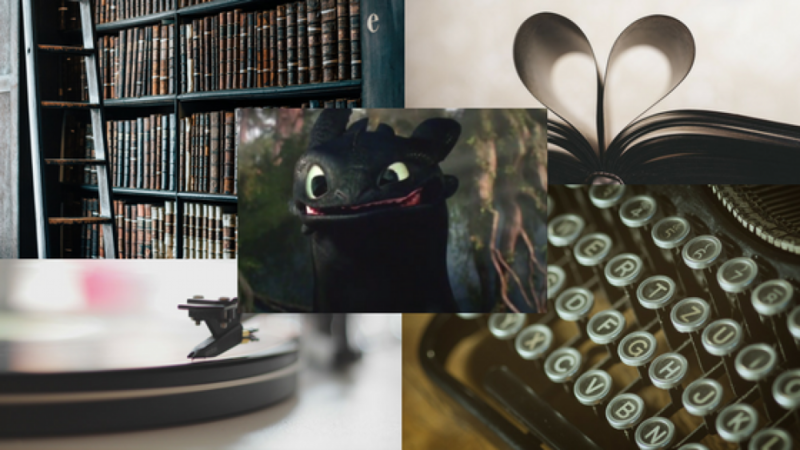 Here’s to another year of bloggin’ :D Happy New Year!! 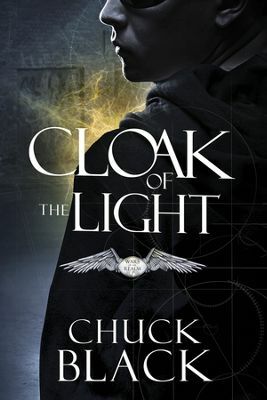 “Cloak of the Light” #1 in Wars of the Realms series by Chuck Black. What if…there was a world beyond our vision, a world just fingertips beyond our reach? What if…our world wasn’t beyond their influence? Tragedy and heartache seem to be waiting for Drew Carter at every turn, but college offers Drew a chance to start over—until an accident during a physics experiment leaves him blind and his genius friend, Benjamin Berg, missing. As his sight miraculously returns, Drew discovers that the accident has heightened his neuron activity, giving him skills and sight beyond the normal man. When he begins to observe fierce invaders that no one else can see, he questions his own sanity, and so do others. But is he insane or do the invaders truly exist? 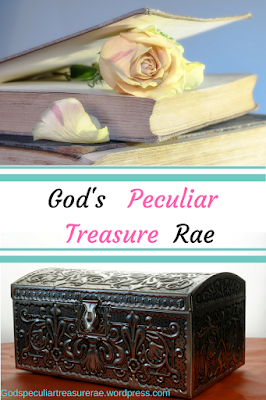 With help from Sydney Carlyle, a mysterious and elusive girl who offers encouragement through her faith, Drew searches for his missing friend, Ben, who seems to hold the key to unlocking this mystery. As the dark invaders close in, will he find the truth in time? Oh my goodness. Wow. I’m kinda screaming inside, right now. This book…! I feel like i don’t have adequate words to describe what I am feeling and thinking about this book. After I requested the book for review, I took the time to read the description completely, and though it sounded intriguing, it also sounded different from what I usually read. It was like Science Fiction, which I rarely, if ever, read. This book goes so much deeper than ‘science fiction’ though. Everything about it is just so…complete. So amazing. I have tried several times to explain this book and what it’s about to others, and every time I seem to fail because…it’s…augh…sdgfdfg..Wow! Amazing! I’m still so excited about it, even though I finished it. “Cloak of the Light” talks about accelerating light, seeing into another dimension, but also so much more. Mr. Black does an exceptional job of creating his characters so real, relatable and just astounding. I know it is all to the glory of God, and that makes it all the better. Each one of Mr. Black’s characters has such depth to them; in every book of his (that I have read, at least!). But unlike his, “Knights of Arrethtrae” series, “Cloak of the Light” is not in a fantasy-kingdom-world. It is in “real-life”, aka modern times. 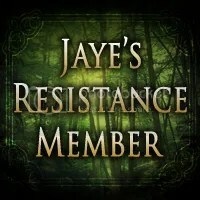 I found that aspect interesting as well, especially since I just got reading the last book in The Knights of Arrethtrae series. At first, I thought this book was nothing like his KOA books, but as I got going I saw little hints and glimmers of that style of writing, which I loved. It just made the story so good. Everything made the book so good. I am truly impressed. This book had my heart pumping – I got so caught up in all of it. It was so fast-moving and had me literally on the edge of my seat. I’d have to stop from time to time because I would realise I was all tensed up. And I say this as a good thing for the book. It is so well done! And sometimes I got frustrated with Drew. Ben’s friendship is true, and very cool. Sydney – well, she’s pretty great. At first I was thinking “Augh, she’s too much of a perfect-Christian” but that is SO off-base. She is not that kind of Christian where you dislike her. No, you admire her, and you get to know her. Plus she had some good schooling *cough, cough*. All in all, I was thoroughly impressed with this book, and can hardly wait for the next book to come out. Chuck Black is so spot-on with the spiritual aspect of it all, I am continually amazed by his books, and inspired by his desire to write for God. I highly recommend this book, though just to warn you that you’ll want to read the next in the series soon after, even if you’re not able to. But don’t let that stop you! Such a good book!! Though I do realise that everyone has different tastes. :) See for yourself if you like this book…! :) I give it 5 plus stars. Recommended ages: 14 and up. We’re instructed to thank God in all things. And usually when we are thankful, we’re happy or joyful. Thanking God then is not so hard. But I’m sure we realise that we are to thank God in the hard times as well. That is rather difficult to master, and remember sometimes. When we’re going through trials, it is hard to say “Thank you, Lord” because we don’t necessarily feel thankful. But then, we’re not asked to be thankful only for the hard things, but we’re asked to be thankful in the hard things. Maybe not ‘for’, but definitely ‘in’. But now I bring to you another kind of ‘thank-you’, and perhaps you’ve experienced this before, for I did not just ‘come up with it’ (haha, no. “There is nothing new under the sun” ;)) This kind of thank-you God showed me last night. A heart full of sorrow can still be a thanks-giving to God, for we still trust in Him through our sorrow. We may not understand, but we trust. I read once, somewhere, that David in the Bible often had one foot in peace, and the other foot in sorrow. He balanced the two. He started out many of his Psalms questioning, doubting and telling God about his sorrow, but always, the psalm ended with David still trusting in His Lord. God not only accepts, but cherishes, a sorrowful thank-you. A Thank You born out of sorrow. A Thank You born in sorrow. God is our Abba Father. He so wants us to come to Him with everything and in everything. Not run from Him. Sometimes, when we become angry with Him, we withdraw and try to run and hide from Him. But “where can I go that You are not there? Where can I hide from You? If I make my bed in hell, you are there, if I flee to the mountains, You are there…” etc. And He wants us to tell Him what we’re going through. He can handle our anger. He doesn’t get angry back at us when we tell Him our anger. He just doesn’t. That is awe-ing. I am going through a trial right now. A tribulation, if you will. And it’s a physical trial and it hurts. literally hurts. I know I am where I am at though, because God has me here. And I’ll move when He tells me to move. For right now though, and especially last evening, all I could offer Him was a sorrowful thank-you. And that’s all He wanted. I cried out from a heartful of sorrow in Thank-You and He accepted it. He cherished it, and He bottles my tears. Same as He does yours. Tired, Worn, strong, weak, and still holding on. One thing that I am finding out, that is pretty much concrete, is that I am exactly where God wants me. He wants me at the very bottom, and He wants it so I can’t do anything. Because He says, “Apart from Me, you can do nothing” and I keep seeking Him, and He keeps having me where I’m at. I am learning that I really can’t do anything unless He wills it. And He’s comforted me with the fact that He is in my tears. That is Him. I am waiting on Him to give the “go-ahead” for a couple of things, and so much of me wants to just push past that and do it myself, but I know that it is best to wait for Him to say, “It is time”. So I wait. And I pray. And I pray some more. And I cry a lot too. But that’s okay. Some days are good, and some days I can barely look up. But that’s okay, too. Today is kind of one of those “not so great” days. I just feel bleh. Tomorrow will be different though. And so I will keep waiting on my Lord and Saviour. I recall that bit most, because I am not quite out of that same valley. I am in a different path, a different setting, but this year has been a most interesting one for me, spiritually. I am not as worn, not as tired, but I still can relate to those words I wrote that April day. There are many days when I break down and ask God many questions regarding this situation. But He is ever faithful, even on the days I am not so sure and I run from Him. This morning I woke up earlier than usual, and I was still plenty tired and so I just laid on the couch downstairs for a while and worked through what I was feeling on something with God. He gave me answers and helped me with where I am at right now. Every question and emotion I threw at Him, He answered and comforted me on. What a great God we have! I will not admit I am over or out of this place. I don’t know how long it will last (it seems to be lasting forever XD). Thanks to a dear friend, I have been made aware of Toby Mac’s new CD. And I am pretty excited about it :) I hope I can get it soon. We’ll see. Here’s one of the songs. Maybe you’ve heard it (I am slow at being made aware of new songs and CD’s – even if they’re from Toby Mac, who is one of my favourite singers. =)). “Just checking he’s comfortable” says the cat. Haha. 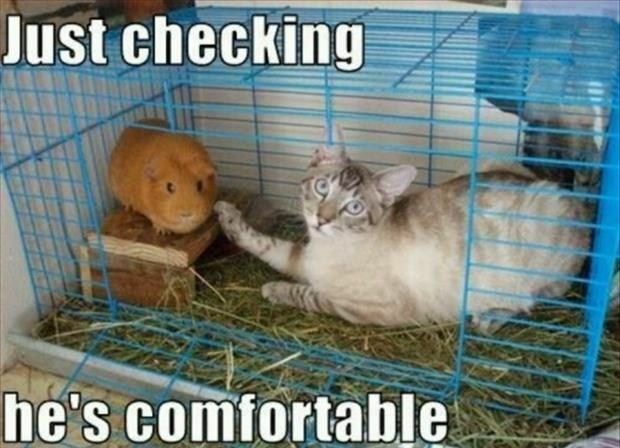 One of our cats, Nemo, would love to go sit in with one of my guinea pigs, until he tipped his cage and nearly scared Piggy silly. It was fun to watch them, though, before that happened, especially because Piggy was afraid of EVERYONE and just about everything, but he didn’t mind Nemo. Very sadly, dear Piggy passed away a few days ago :( He was my… 5th guinea pig; I’ve had 9 total, including my three baby piggies I still have (who are not babies anymore). He also lived the longest – about 8-9 years! The average age I’ve found for piggies to live is 5-6. But diet has a huge play in that, and my family and friends can certainly vouch for the fact that I fed them extremely well.